I have never been a huge fan of carrot cake. In fact, I am solidly against any baked good that contains fruit, vegetables, or nuts. White cake with white buttercream frosting for this girl. Chris, on the other hand, has a major weakness for carrot cake. Especially the kind with cream cheese frosting. Fortunately, our cake preferences don’t matter very often. You see, I have zero willpower when it comes to baked goods, so I make every effort not to ever keep them in our house. Chris seems to be mostly ok with this, his willpower is better than mine, but it doesn’t matter because he wouldn’t have a chance to eat the cake anyway. Chris likes to joke with people that he never gets to eat ice cream because I don’t like to have it in the house and when he does buy it, I eat it all before he gets to have any. Same goes for cake, cookies, or anything else sweet.His obeservation is completely accurate. I have a history of housing half gallon containers of ice cream in one night. Sad but true. Needless to say, Chris did a double take last weekend when I suggested that we bake a cake. Knowing my disdain for mixing veggies and baked goods, he was probably extra surprised when I suggested a carrot cake. I began gathering his cake requirements, which, much to my chagrin, included fruit, vegetables, and nuts, and set out to find a recipe. 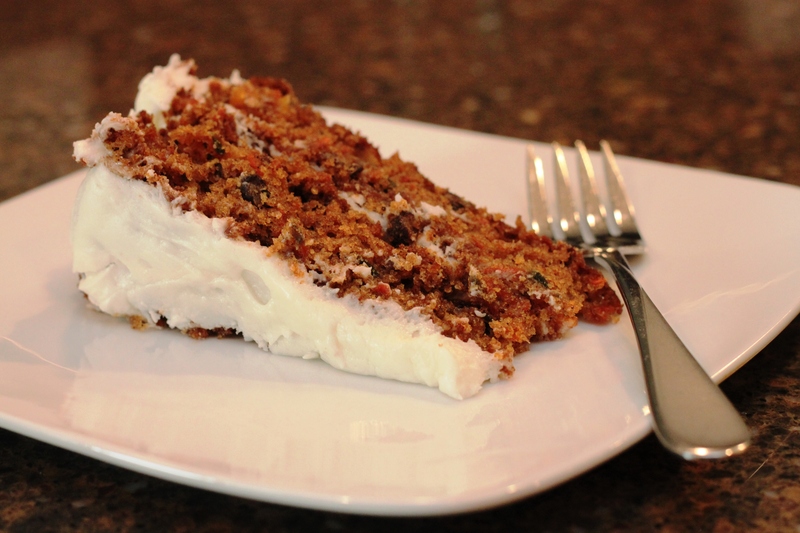 I’m still not sure how he decided on carrots, mango, dried cranberries, and pecans to be included in this cake, because there does not seem to be a single reputable carrot cake recipe on all of the internet that includes all of these ingredients. I almost backed down from his challenge, instead going for a more simple recipe, but, finally, I decided to go for it. I started with Bridget’s recipe because I trust her above all others for any kind of baked goods and made modifications from there. In the end, my finished product is probably nothing like hers was, but that’s ok. It was a phenomenal carrot cake, in spite of the fruits, veggies, and nuts, and it definitely won Chris’ approval! For the record, this cake lasted more than one night; we did not finish it until the third night and no, we did not share any. Adapted from The Way the Cookie Crumbles. Grease and flour two 9″ round cake pans. In a bowl, whisk together flour, cinnamon, baking powder, baking soda, and salt. In a separate bowl, combine the carrots, dried cranberries, pecans, and mango. Beat together the oil and brown sugar in bowl of a mixer. Slowly add in the eggs, one by one. After beating in the eggs, slowly add the flour mixture to the mixer bowl, mixing only until the flour has fully combined. By hand, fold in the carrot mixture, then divide evenly between the prepared cake pans. Bake for 40-50 minutes or until it passes the toothpick test. When the cake is removed from the oven, allow to cool for five minutes before removing the cakes from the pans and transferring to a wire cooling rack. I first saw a recipe for Cookie Dough Hummus on Branny’s blog last fall while I was in India with my under equipped kitchen and I was so intrigued by it that, months later, I still remembered that I wanted to try it, but, instead of serving it as a dip, I wanted to try it in my favorite cookie dough form: frozen, raw, and as a mix-in for other foods. I’m sure that a lot of people would be sketched out by the idea of chickpeas in “cookie dough”, but, like with her Black Bean and Avocado Brownie recipe, I was completely onboard with again substituting beans (in this case legumes) for flour and giving it a go. In an uninformed taste test, Chris admitted that these dough bites did quite closely resemble peanut butter cookie dough. I must add the disclaimer that he knew there was a catch just because of the fact that he came home to a freezer full of cookie dough. He knows me too well to be fooled into thinking that I would actually do anything that awesome. Adapted from/inspired by The Wannabe Chef via Branny Boils Over. For best results, peel chickpeas to ensure a smooth end product. Combine ingredients in a food processor and blend until creamy and smooth. Place in freezer for 30 minutes or until firm. Use to top ice cream, yogurt, pudding, oatmeal or anything else. My cooking, and baking (?!?! 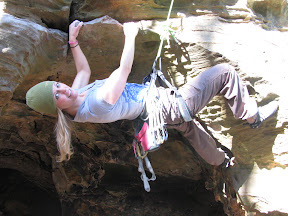 ), over the past few weeks has been decidedly un-Brittany. Who is this girl in my kitchen making cupcakes and cookies? Chris sure likes having her around. I do too, but maybe only until my bathroom scale arrives from India. Until then, I’ll bake with reckless abandon. So about that bathroom scale arriving from India. Someday it is going to arrive, along with our other possessions, via an air freight shipment from Chennai. Twenty eight days ago, Chris watched as an Indian moving crew packed up our apartment. Just this week we received reassurance that our shipment was in fact at the airport in Chennai. I can’t even imagine how long it would take to get out stuff if it had been shipped on the water! On some level, I am happy not to have the scale. I am content knowing that my pre-pregnancy jeans all zip. That makes me feel good about myself and content with my lack of exercise and above average sweets consumption. Hopefully I am not in for a rude awakening when it finally gets here. Another item that I am not really missing yet is my bicycle. Although I feel normal enough to run now, I am definitely not up for sitting on a bike saddle yet. Surprising, I know. Who would have guessed? Overall, I do not have too many things stuck in transit that I am worried about, and, in retrospect, I am glad that I packed the third suitcase that I got charged for. Chris, on the other hand, took the opposite packing approach from me and shipped most of his clothes. I am still not sure what possessed him to do that. It will make for some interesting work outfits for him. Not that it matters if he has dress shirts or not; our iron is at the Chennai airport. Go figure. In the meantime, I will continue to bake, and eat, batch after batch of these tasty cookies. Whip egg whites, vanilla extract, cream of tartar, and salt in a food processor with egg whip or in a mixer until soft peaks form. Fold in chips using a rubber scraper. 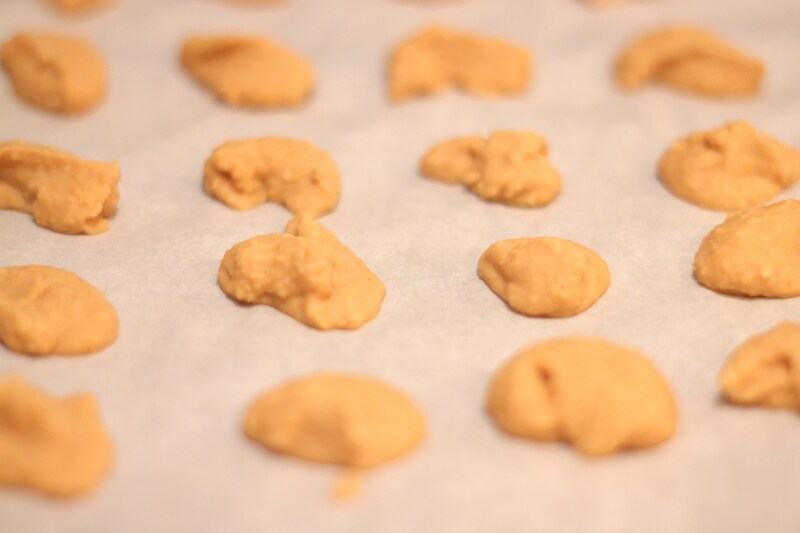 Using a spoon, drop batter onto the baking sheet leaving 1″ gaps between cookies to allow for spreading. Bake for 25-28 minutes depending on the size of cookies. Slide parchment from baking sheets and allow cookies to cool on the parchment. After nearly a week without blogging, I think I’m ready to tell you more about ‘Meatfest’. Naturally, the meats were the star of the show, but still, strangely, I felt the need to make dessert as well. This is really odd for me as I almost never make real, unhealthy, unadulterated desserts. It may have been a sign of nesting and an indication of what was to come. In fact, as I prepared for this feast, my friend Beth commented, ‘Brit, I think you are nesting.’ I denied it, after all, it was far too early, but in retrospect she may have been right. Anyway, whatever the reason, I’m glad that I made these cupcakes. They were amazing, so good, in fact, that this typically dessert-free girl is going to attempt a cake version of them later this week. From David Leite via The Way the Cookie Crumbles. Line cupcake pans with 18 cupcake liners. Combine the butter and sugars in the bowl of a mixer and cream together for about five minutes. While the butter and sugars are mixing, whisk together the flour, corn starch, baking powder, baking soda, cinnamon, ginger, nutmeg, cloves, salt, and pepper in a large bowl. Add the eggs, individually, to the butter and sugar, scraping down the sides of the bowl between eggs. Slowly alternate mixing in dry ingredients and buttermilk mixture, scraping down the sides of the bowl in between. Add pumpkin and blend until smooth. Spoon mixture into the 18 cupcake liners, filling each about 3/4 of the way. 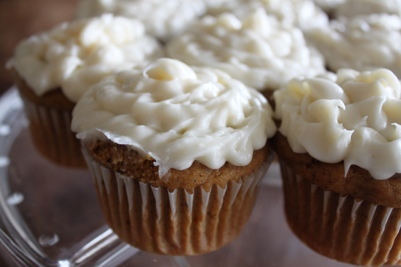 Bake for 20-25 minutes, until a toothpick inserted into the middle of a cupcake comes out clean. Cool cupcakes on a rack. Combine butter and cream cheese in the bowl of a mixer, beating for about three minutes until smooth. Add vanilla and continue to mix. Slowly add powdered sugar to mixing bowl, occasionally scraping down the sides, until fully combined. Every night this week has felt pretty much like summer and with the crazy long daylight hours that we have in Indiana, we have been spending plenty of evenings in our outdoor living room, or, during our first summer here, our only living room. 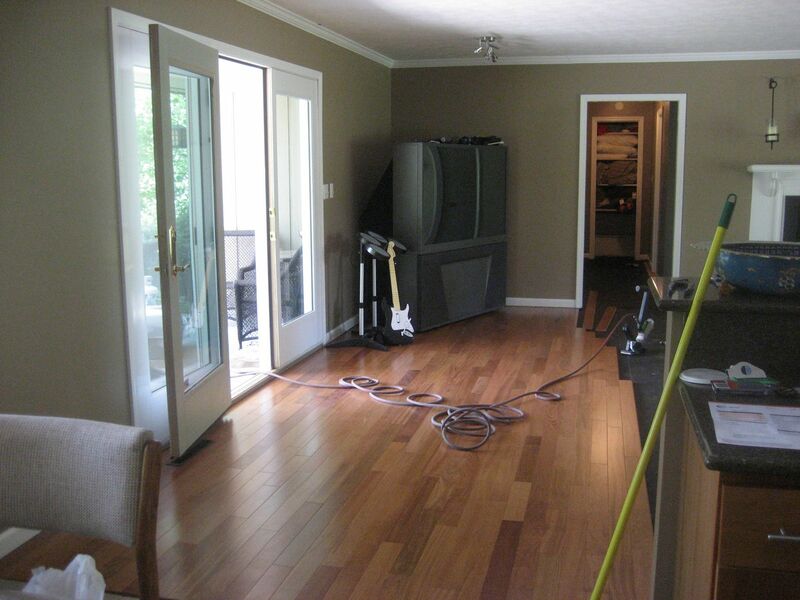 The first summer that we lived in our house, we had no furniture. Well, that isn’t completely accurate, all of our furniture was in our garage while we spent countless hours installing hardwood flooring. It was one of those Murphy’s Law projects that should have been done in a week or two, but in reality took about six months. 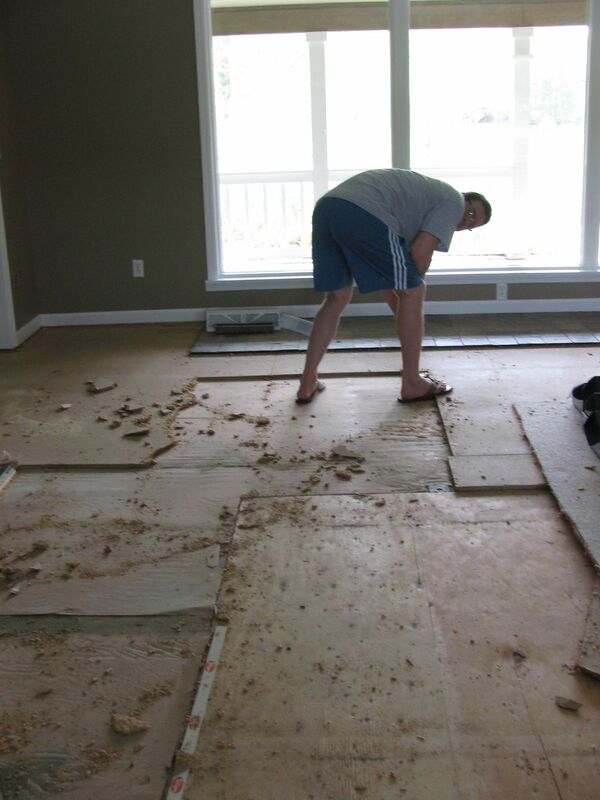 When we first bought our house, we didn’t plan to change the floor at all, but almost immediately we realized that the carpeting smelled awful. Even after shampooing and deodorizing, the smell was completely overpowering. It quickly became apparent that our floor had been doubling for a litter box. 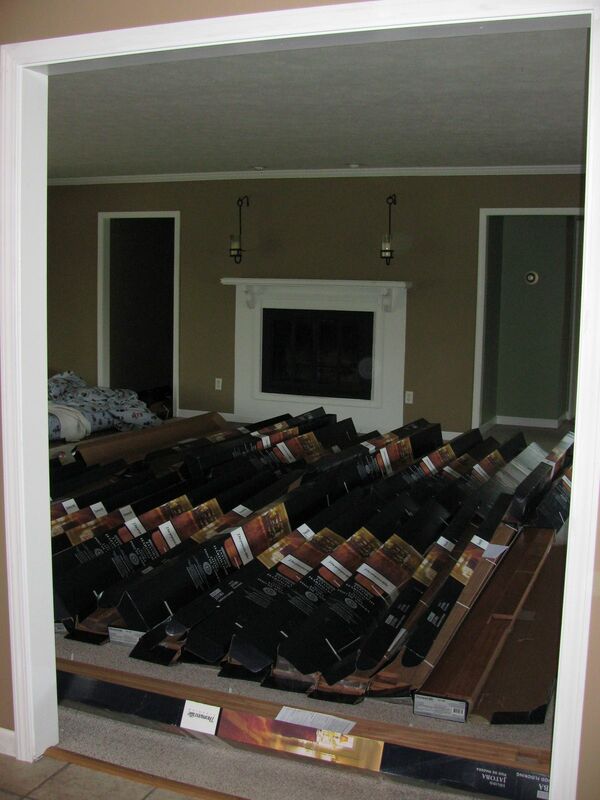 No problem, just tear out the carpet and nail down hardwood, right? Riiiight. That’s what we thought this first day when we had our flooring “breathing” to adjust to the humidity. 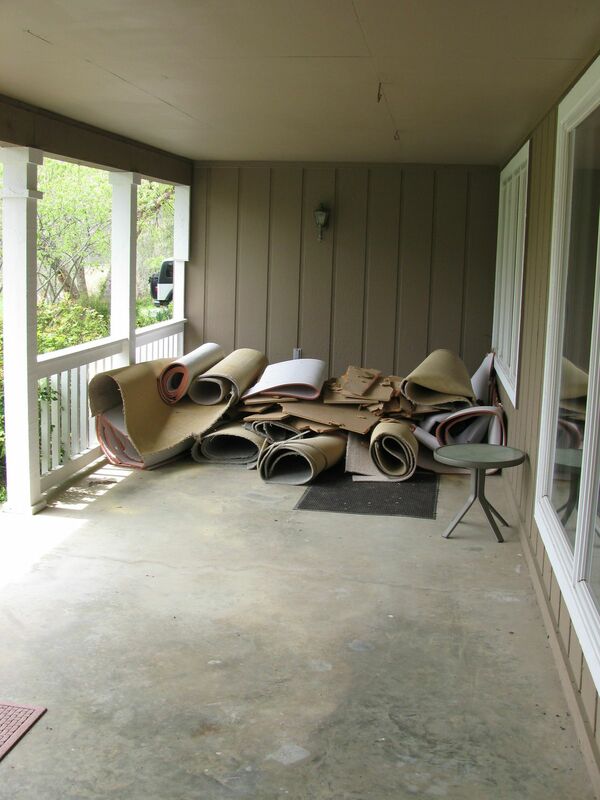 …install and level plywood. You didn’t think it would be that easy, did you? Did I mention that I was still working in Memphis five days per week? Chris did his best to work on the floor while I was gone, but between that project and our massive lawn to mow, it was a Herculean juggling act. As summer came to a close and it began to get too chilly for me to appreciate the comfort of our outdoor living room, we were finally able to move into our house for real. We still like to relax on our back porch, and while I don’t think we will ever again do so with the frequency that we did that summer, I still enjoy grilling extravaganzas like the one we had last Sunday. Sunday’s all-grill dinner was topped off with none other than a grilled dessert. I’m a huge fan of grilled fruit and this may be my favorite. It had the sweetness of dried fruit, but was juicy like the real deal. An added bonus is that Chris, our house grill master, does the cooking when I come up with (almost) all-grill dinners. Heat balsamic vinegar in a small saucepan, boil for several minutes until in reduces by half. Mix in olive oil, adobo paste, and salt. 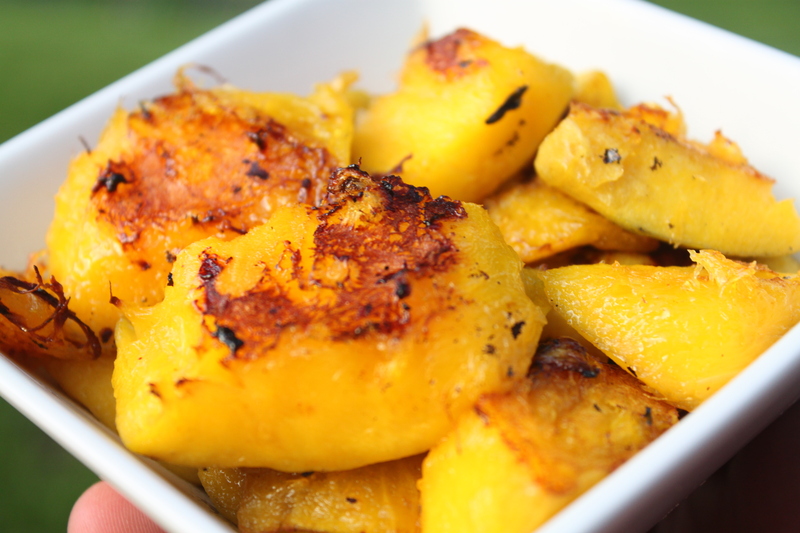 Marinate the mango slices in the balsamic sauce for 2-3 hours or overnight. Grill the mango in a grill basket, turning once, until browned and slightly softened, about 5 minutes total. Serve warm or cold, it is excellent both ways. a.k.a. Green Radioactive Sludge Smoothie. Green Monsters are one of those things that you will either love or hate because it takes a certain palate to appreciate emulsified spinach, or worse yet kale, disguised as a (typically sweet) smoothie. I happen to be a proponent of Green Monsters. It all got started a few summers ago when I first heard about these Shrek-like smoothies and decided to give them a try. At first, I was totally hooked, slurping down the radioactive sludge nearly every day. Eventually I got tired of washing my blender, so the Green Monsterfest subsided. Let’s face it, scrubbing dried-on spinach out of my blender is not my idea of a good time. I prefer low maintenance meals with little to no cleanup, lazy girl foods. I still cook in Teflon pans (shhh, don’t tell my mother in law!) because if I had to scrub cooked-on food out of stainless steel pans with any frequency I would probably be relegated to daily take-out. Over time, my relationship with the Green Monster has evolved. Today I tend to only drink Green Monsters when I have something to gain from it. For example, I like to make Green Monsters when I realize that I own half a pound of spinach that is wilted slightly beyond salad goodness and needs to be used ASAP or when our my (Chris is not a banana fan) bananas are getting a bit too mushy and brown to spread peanut butter on. I have tried many Shrek-smoothie combinations, but this one is probably best for keeping me full and I think it tastes pretty good too! Add ingredients to a blender. It works best to put the spinach somewhere near the bottom of the mix so that you don’t have to scrape stray spinach leaves off the sides of the blender – I hate to get a spoon dirty if I don’t need to. Pulse several times to break up the frozen banana, then use the liquify setting on your blender if it has one. Serve cold. I sometimes store half of the Monster in my refrigerator for up to a day or so. Yesterday morning I learned about grilled peaches. Can you say perfect timing? There was a whole bag of peaches in our CSA box this week. 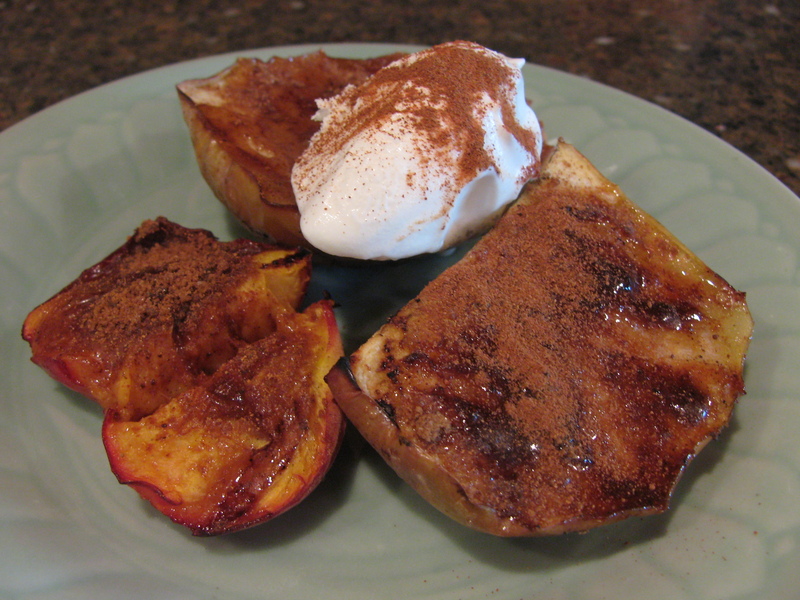 I had grilled peaches on my mind all day, I could just tell that they were going to be great! Then I got home and realized that I had already eaten all but two of the peaches. I guess there weren’t as many peaches in the bag as I thought. No problem, we had apples also and the cinnamon and brown sugar topping for the peaches reminded me of the flavors of apple pie and baked apples. Mmmm! I quickly decided that we would have grilled apples as well. It turns out that grilled peaches are awesome, but grilled apples blow them out of the water! Slice apples and peaches into large enough slices to not fall through your grill grate. Combine cinnamon and brown sugar, set aside. Place apple and peach slices skin side down and grill for several minutes with the grill lid closed. Once again, flip the fruit so it is skin side down. Sprinkle the top with the cinnamon and brown sugar mixture and cook for several more minutes with the grill lid closed. Turn off the grill, then flip the topping side down and let sit, lid closed, until the cinnamon and brown sugar caramelized. Serve warm with a few scoops of ice cream and/or your favorite whipped topping. We went with just fruit and whipped cream.